I think one of the scariest repairs I’ve ever done on a car was the first time I ever worked on the fuel line. I know just having gas on the ground or open does not mean there’s going to be an explosion, but for someone without much experience in auto repairs, the first time you work on a fuel line, it keeps running through your head that there might be something you didn’t tighten properly or there might be a leak and at the next stoplight, you’ll be sitting there and a puddle of gas will be forming under your car, just waiting for when you rev your engine and — BOOM! At least that’s the feeling I hand until I had worked on a fuel line a few times and got used to it. With my new car (often called Mrs. Peel because she’s such a classic beauty and can kick some serious tail, if you haven’t been following along), one of the two mechanical repairs I needed to attend to quickly, that could actually effect the functioning of the vehicle, was a leaking fuel line at the rear, near the fuel pump and fuel filter. I was lucky that I only had to replace part of the fuel line and not the fuel pump. Replacing the pump would not be too much harder, but it would cost more. At the left I have a picture of the area. This is only a thumbnail. If you click on it, you can see the parts in much more detail. This is under the back of the car, near and behind the passenger side wheel.Â To get to it, you’ll need to back the rear wheels up on ramps.Â Note how wet the metal tube on the right is. That is from my fuel leak. I suggest, if you can, opening that picture in another window or printing out either the picture or this text so you can see both at the same time. As much as a computer geek as I am, you’d think I could put labels on the picture for you. I do have a good photo editing program, Gimp (it’s open source, as is all the software I use), but it’s late and I’m trying to get a lot done so I can return to the deep, dark, dank pit of serious, hard programming work so I can finish some of that up. So, sorry for not directly labeling the picture, but, as sometimes happens, life has gotten in the way. The cylinder with the numbers on it, if you haven’t guessed, is the fuel filter. The cylinder below it is the fuel pump. 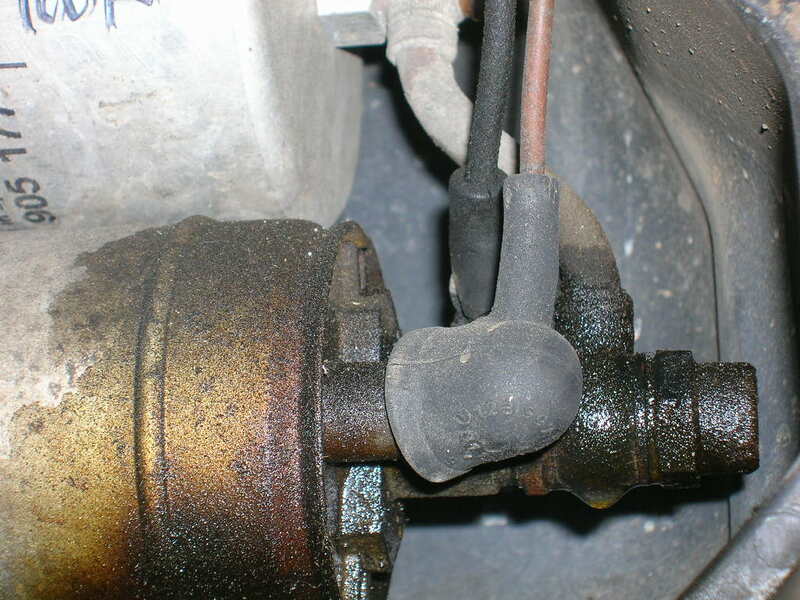 The thick tube coming into the fuel filter on the left is from the gas tank, which means if you disconnect it, it will leak gas. You can use this if you ever need to drain the gas tank. To the left I have a picture of parts I needed for the repair I was doing. Note that I’ve included a good sized flat reservoir. Whenever you open the bottom end of any tank, whether it holds oil or gas or whatever, it’s hard to be sure exactly where the fluid will start pouring out, so I like having something like this I can catch it in. Then, once the stream is constant, I can put a gas container in place. I’ve had friend who say when they deal with something like this, they’ll do one of two things: 1) They’ll have all the parts laid out so they can move quickly and once they have to undo a hose like this, they’ll plug it with their thumb, hold it there, then do all the other work, or 2) They’ll plug it with a bolt that they kept handy for this situation. Notice I have a couple bolts read because I’m not sure of the size of the hose I’ll have to plug. In the long run, none fit and I had to just let it drain. Since the gas went through the pump first, it wasn’t draining too fast and I was able to get everything done at a slow pace without losing much gas. What I did lose just went back into the tank, since it wasn’t dirty. It’s also comforting to see fuel come out of your tank and see it’s not full of sludge. There are different repairs to do under here. My general thoughts on something like this is that if you’re in the neighborhood and a filter is not new and you can replace it, go ahead and do it. It saves a trip under the car later. I needed to replace the fuel line and decided to do the filter as well. It would not have taken much more work to replace the fuel pump, but there’s no sign my pump is dying and I didn’t want to have to pay for a new one. I’m not going to describe any one repair, but to go over what is here and what can be done and what needs to be remembered. The first thing to remember is that you need crush rings for each joint you’re going to be working on. If you don’t use them, you’ll be back under the car again, putting them in from the leaking joints. The Mercedes dealers all have access to EPC, the Electronic parts catalog. You can also gain access to the same catalog for $20 a year (yes, $20 a year!) at http://startekinfo.com. If you have access, the diagram you need is under “47 Fuel System” and the sub group is “60 Fuel Pump Package.” Pick Diagram Number 4. That will give you a diagram of all the parts included, but it may be confusing because it’s reversed from the angle you’ll likely see this assembly from. Use that to make sure you have all the star washers, nuts, and crush rings you’ll need. If a nut looks at all rusted or seems like it’s wet or saturated, I’d suggest having a potential replacement ready. If you’re like me, you don’t like having to get out from under the car to get more parts during repairs. 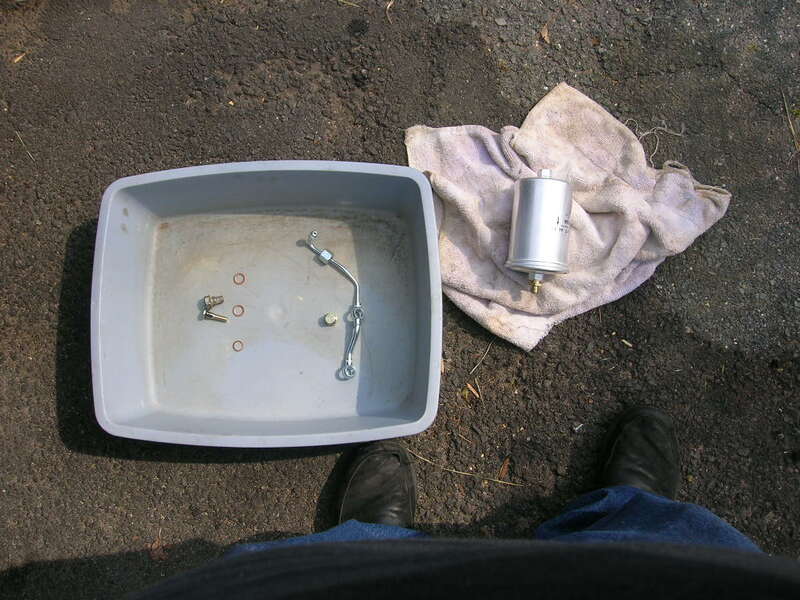 In my case, I removed the metal part of the fuel line that connected the fuel pump to the fuel filter and the accumulator. In the diagram on the left, you can see gas draining from the fuel pump into a gas container. You can also see a small cylinder above and behind the filter. Unused gas returns from the engine and goes in the accumulator, where it can go through the filter and go back to the engine again. The hose on the right is one metal hose that connects to all three (the accumulator, the filter, and the pump). I suggest if you’re going to take this, or any part, off back here, you’re best off starting with the connection nearest the tank, so you have only one leak to deal with and not multiple ones. I’m getting out of order, but overall, I’m still trying to describe the parts and what to do in handling them. Notice in the first picture (again on the left), there is a protective covering that sits in front of the assembly we’ve been discussing. (In front as in between them and the front of the car.) I’ve found it’s almost impossible to work on the fuel filter or pump without removing this shield. Then there is one more “must remove part”. Look at the metal band that goes around the filter and the pump. There’s a long screw that goes through this band and is bolted on the other side. Remove this bolt, otherwise it’ll be hard to remove the fuel filter or the fuel pump, or to shift them to get to parts more easily. It’s also one of those “oh, I forgot to put this back in” parts that is very easily forgotten when finishing up. In my case, as said, I was fixing a fuel leak. I was hoping it would be just a crush ring or a loose nut. That would save a few bucks, but if you look at the are that is wet, you can see that the wet part is above the metal fitting (behind the electrical connector). If it were a loose nut or a crush ring, I doubt the wet area would have crept up so high. While the car was running, I could see drips form on the rounded section of the connector. For any repairs in this area, first remove the protective shield, then remove the bolt from the strap holding the filter and pump in place. Make sure you have a large reservoir ready and in place before removing any nuts or connectors on the tubes. I like to have one “splash” reservoir for the initial splashing out of fluid while I’m still loosening (and later tightening) a bolt, then another gas container to keep the gas in so I can pour it back into the tank later. After removing the shield and bolt, and making sure you have all the parts you need, including all the crush washers, make sure your parts are laid out on a clean surface you can keep under the car with you. I keep the parts on one side of whatever I’m using (a clean board or another shallow pail or something like that) and the tools on the other side. Also, when it comes to crush rings, my general rule is to use one between each bolt and surface. If a bolt goes in between two parts, I use a crush ring on each side, if it fits. Why? I’m paranoid. Now you’re ready for whatever you need to do. 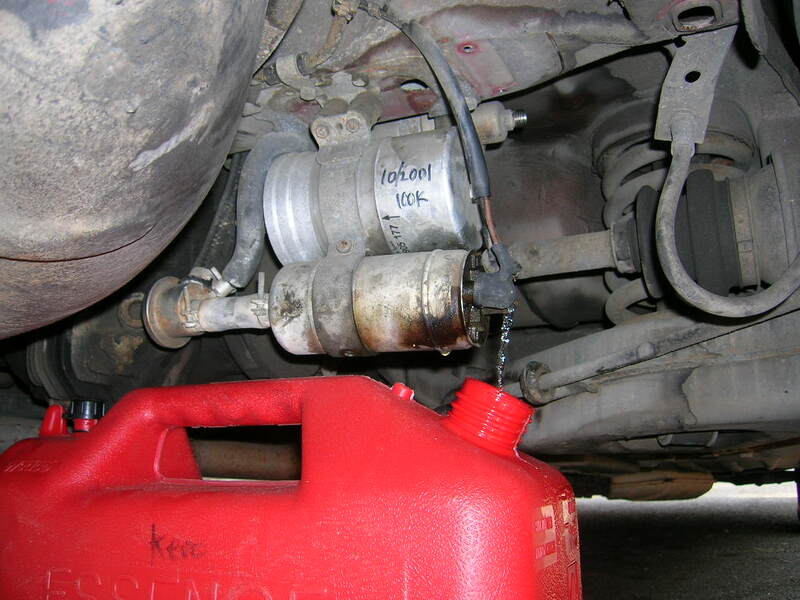 Undo the bolt or fastener on whatever connection is closest to the fuel tank, so you won’t have a number of leaks to deal with. Once it’s unconnected and you can position it and your gas container so the fuel is captured, you can do what you need. Most of the work for here, for whatever you’re doing, is pretty simple. Basically, disconnect the part or parts you need to remove. At each point, be sure you pay careful attention to what nuts, bolts, and other connectors come from each connection. This is not rocket science. Basically, you undo connections, making sure you keep track of which nuts and washers go on which parts. Then remove the part or parts you need to replace, put in the replacements, then reconnect them. I’d suggest reconnecting the part closest to the fuel line last. When you’re done, clean off everything. When I started working with computers, I learned an important rule: never replace the case until you’re sure everything works. It’s Murphy’s law in action: If you think it’s perfect and put the case back on before checking everything, you can almost be sure something will fail. With cars, I want to make sure I’ve done what I need to do and can check it by running it before I take the car off the ramps. On the left you’ll see a picture of the same parts again. Notice all the leaked gas is gone from the pump. If you look closely at the connection that was leaking, you can see the crush rings in place along with the new hose and connectors. This was taken after I had checked everything out and had started the car. It was still on ramps and I had not yet replaced the protective shield. Note the bolt holding the metal strap around the filter and pump is not in place yet. Once you’ve made sure it’s all working, replace the bolt on the strap and the protective shielding. In this photo, you can also follow the metal line I replaced from the fuel pump to the fuel filter to the accumulator above it. I realize I could include more details, but I wasn’t sure whether to go through replacing the filter, the pump, or the less common repair I had to do, which was replacing the line. Maybe I’m oversimplifying things, but basically if you follow the directions I have given and keep track of the bolts, nuts, washers, and crush rings as they come off the parts you’re removing, then replace the bad parts and put it all back together, that’s about all there is to it. It can be difficult to slid the filter or pump out of place and the new one back into place. Generally patience helps here. If you need more detailed help, please don’t hesitate to ask in the comments. I’m not professional mechanic, but I’m glad to share what experience I do have. 9 Responses to Give It Some Gas! Very interesting it’s good you can direct us all in minor repairs so we can be more confident with our cars and save some bulks! I have the humming sound and I suspect it is the fuel pump on my 1985 380 SL. Very informative article/blog and I really enjoyed reading educational stuff especially if it will save me some cash to spend on important things like gas. Thanks again. Hal- I find your site informative and fun. I am impressed with your 1985 380SL-but it has also made me realize what an incredible deal I got on my 380. If I can figure out where to post them. Please write some more fix it pieces. My sunvisors are also a sore point – like yours discolored and floppy. There has to be an alternative to these nuisances. I want to pull the trim off and fix them but I’m afraid I break something – like the rear-view mirror. If you do write a piece about fixing the visors on a SL, please include pix – they really add to the narrative. Good work – keep it going. Hal, I too have a 380SL, and the exact same fuel leak. My question is: The actual silver line, connecting the pump-filter-accumulator. What’s that thing called, where did you get one, how much did it cost? I get most parts from the dealer, since they don’t seem to charge that much more for them (believe it or not). The best way to find a part is to use the EPC (Electronic Parts Catalog), which is free. Here’s the link: https://epc.startekinfo.com/epc/home.jsp. 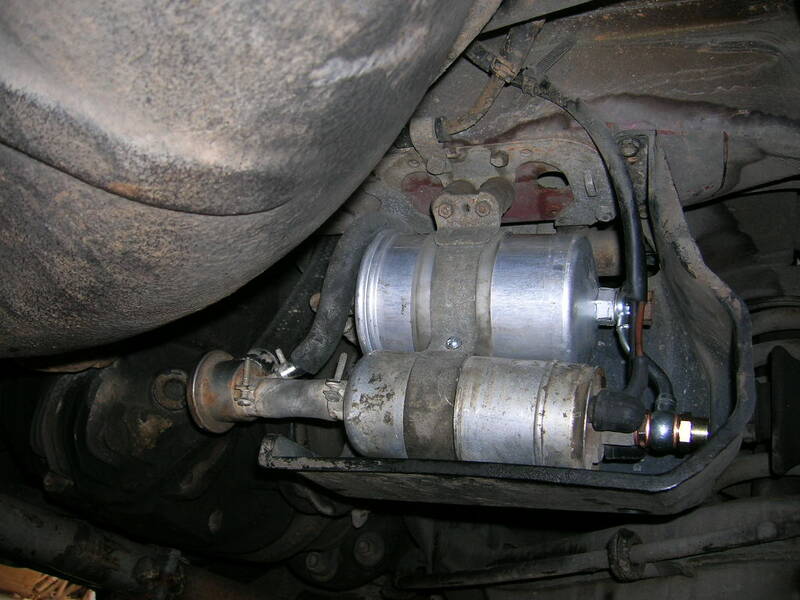 The fuel pump does make some noise that can surprise people when they’re walking around a running car, but if it’s getting worse, that could be a problem. It wasn’t hard for me to replace everything there. As to the odometer, I’m not sure how much trouble that would be. My guess is you’re going to have to send it in, which is about $100 (if I remember) and about a week of work. I had to send it in through the local dealer. 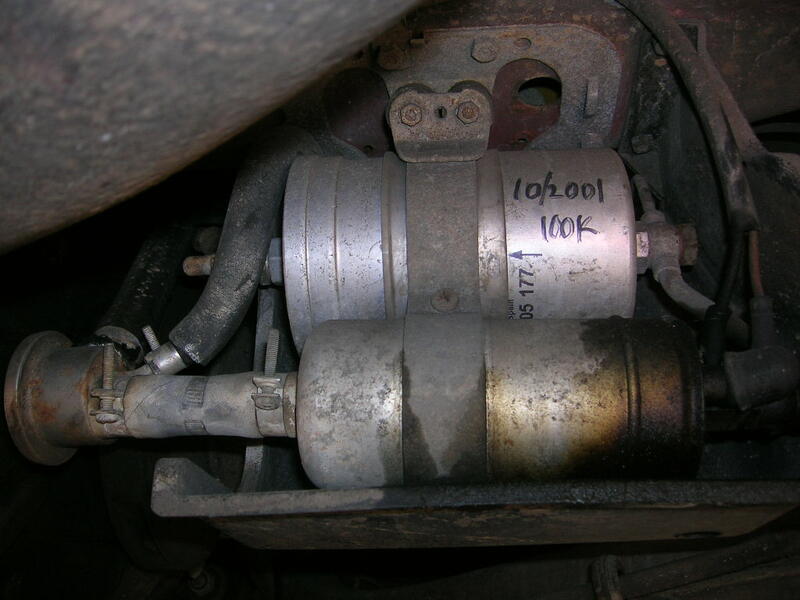 Well, I now have a new fuel filter in my ’89 560SL and, thanks to your instructions above, some hardworking honest mechanic somewhere is out at least $100. Thanks. I also have a 380sl, 1983, and over the last couple of days, I have noticed that the car stutters upon acceleration when the motor is cold, however, today, the motor was hot, and during acceleration, the car stalled. It was difficult to get it restarted. It would initially start, then stall. I eventually got the car home with difficulty, and noticed that the fuel pump was extremely noisey (more than the norm). Do you think I need to replace the fuel pump, filter, lines. Any other parts you would recommend to replace. Thanks, your article was fantastic.